After a fantastic performance at our company Showcase last Sunday we are back to work on our tour piece and workshops. Now we maybe tired but that doesn’t stop us! We’re still buzzing from the success of the weekend and turning that postive energy into something truly amazing! 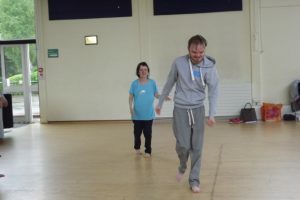 The last few weeks have focussed on our workshops and getting to really know our characters, but now we are begining to get to grips with the main piece as well. And it’s shaping up beautifully, our characters are leading us and we are leading them to create some very special moments indeed.